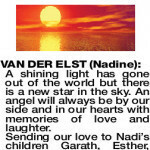 A Funeral Service to Celebrate the Life of the late Nadine Helen Van der elst of Denmark will be conducted in the East Chapel of PINNAROO Valley Memorial Park Cemetery Whitfords Ave, Padbury commencing at 3.30pm FRIDAY (05.04.2019). Those wishing to say a personal goodbye to Nadine may do so at a viewing on FRIDAY at 1.45pm in Silkwood Funerals Home, 8/28 Rudloc Road, Morley. 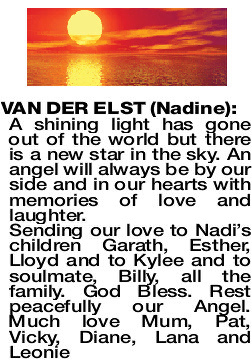 VAN DER ELST NADINE A shining light has gone out of the world but there is a new star in the sky. An angel will always be by our side and in our hearts with memories of love and laughter.